Do you love mooncakes but hate consuming too much fat and sugar from them? With all these health concerns, does this mean that we can't eat any mooncake or sweet treats or buttery food at all? No! No! No!!! Life is short so please don't eat cardboard food!!! Although I'm health conscious, I'm after taste and texture in my food and wouldn't mind eating carbs, gluten, sugar, butter and salt with reasonable moderation!!! They are made with natural colouring and less sugar! Why are these Flaky Coconut Custard Mooncakes less guilty to consume? I did a calculation and found that each of these coconut custard mooncakes contains 33g calculated fat and 11g added sugar whereas a typical lotus seed paste mooncake with two salted egg yolks (mentioned at here) is known to contain 55g fat and has an equivalent number of calories found in 45 tsp (180g) of sugar! Gosh!!! 33g fat vs 55g fat!!! 11g added sugar vs calories found in 180g of sugar!!! Flaky Coconut Custard Mooncakes vs a typical lotus seed paste mooncake with two salted egg yolks... Which one would you eat? The healthier option is very obvious here!!! If you think that these mooncakes are not healthy enough and wish to consume mooncakes that have even lower fat and lesser sugar, you might want to consider not eating any mooncakes then... LOL! 1) Making my own mooncake fillings with moderated amount of sugar and good fat. My two different Homemade Red Bean Paste recipes are at here and here. My Homemade Lotus Seed Paste recipe is at here. My Homemade Yam / Taro Paste recipe is at here. 2) Making my own mooncakes with smaller portion-sizes. My Mini Honey Mooncake recipe is at here. 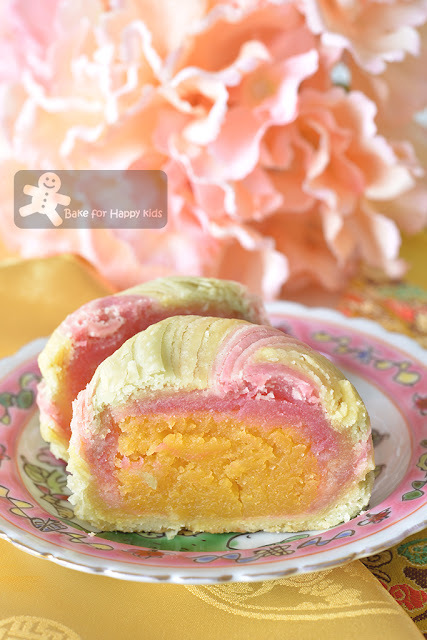 My Mini Custard Mooncake recipe is at here. My Red Bean Paste Mooncake Slices is at here. The bottom line is "Homemade is the best!" because we can choose what and how much we want to put into our food. Agree? If your answer is yes, you might want to watch my video as I will show you how to bake these awesome low sugar flaky custard mooncakes. Mum, can you keep all of these mooncakes for me? Sure! Clearly, I can see that my son is impressed with my baking. LOL! they are very very very yummy! 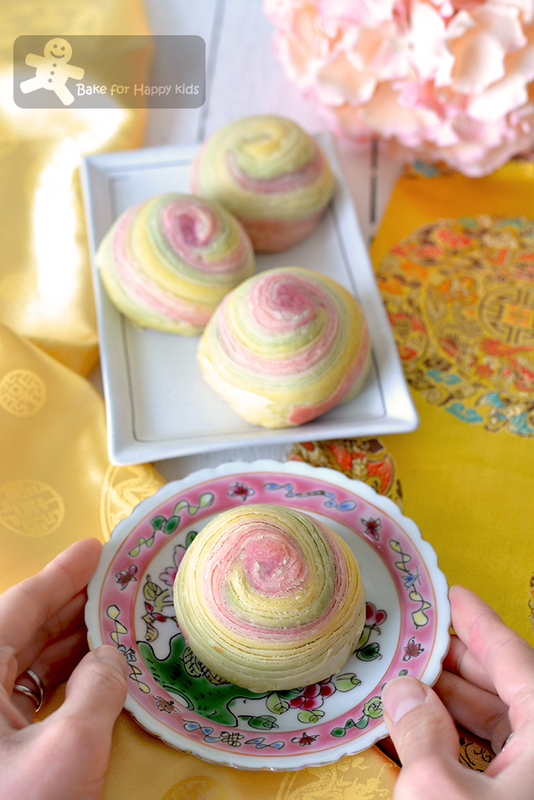 Here's my Reduced Sugar Colourful Spiral Flaky Pastry Coconut Custard Mooncake recipe. 100g regular coconut milk with 24% fat - not the reduced fat ones! On the day before, prepare custard filling. Combine flour, custard powder, tapioca flour and salt. Using a wooden spoon, beat butter and sugar until combined and fluffy. While beating, add egg yolks one at a time and beat until combined. Beat in condensed milk and coconut milk. Sift flour mixture into the egg yolk mixture and mix until combined. Pour the mixture into a heat resistance container and steam over medium-low gentle heat for 25 mins with stirring in every 5 mins. Set aside for mixture to cool to room temperature. Knead mixture until it forms a dough. Wrap custard in cling wrap and chill it in fridge overnight or until required. Tip: If natural food colouring is unavailable, you can substitute 1) red colouring with 1/8 tsp beetroot powder dissolved in minimal water 2) yellow collouring with 1/8 tsp turmeric powder dissolved in minimal water and 3) green colouring with 1/8 tsp green tea powder or spinach powder dissolved minimal water. All these natural food colouring powders are available in most pharmacies and health shop. *I'm sorry that you can't substitute shortening with butter or any other fat in this recipe because only Crisco shortening works the best for this pastry. If you are living in Australia, You can buy Crisco shortening from USAfoods via online or its shop in Victoria . Combine shortening and flour and knead to form a smooth dough. Divide into 9 equal portions by weight (about 21g each). Dissolve sugar in warm water. Combine oil and sugar-water mixture in a large mixing bowl. Add flour, then mix and knead until it forms a smooth pliable dough. Divide into 3 equal portions by weight (105g each). Add and knead in a few drops of one colouring into each portion. Divide each coloured dough into 3 equal portions by weight (about 35g each). Line baking trays with baking paper. Preheat oven at at 200°C. Wrap one portion of shortening dough inside one portion of water dough. Using a rolling pin, roll out the dough into a flat oval shape, then roll it tightly like a Swiss roll. Use a rolling pin to roll the dough out into a long strip. Repeat the same with the remaining 8 portions of water and shortening dough. 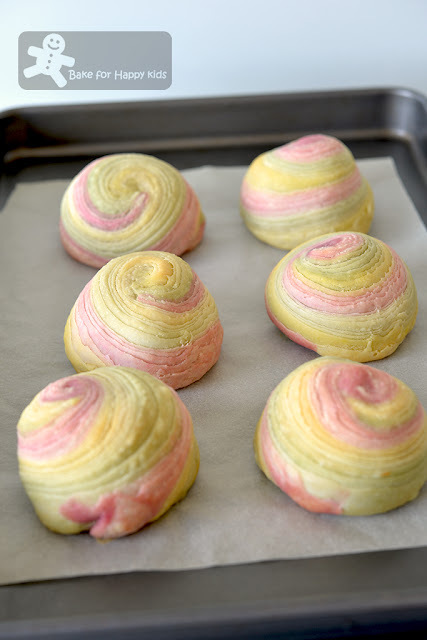 Stack 3 different coloured dough strips together and roll it out into a flat dough. Then, roll it tightly like a Swiss roll. Using a knife, cut the rolled up dough into half. Repeat the same with the rest of the the water and shortening dough. You will get 6 dough in total. With the incision part facing downward, use a rolling pin to flatten each half of the dough gently and then roll it out to about 5mm thickness without tearing the spiral designs. Divide custard filling into 6 equal portions by weight (about 45g each). Place each portion of custard filling in the middle of each rolled out pastry. Wrap filling inside the pastry. Seal the end. Arrange shaped mooncakes on prepared tray and bake for 15 min. Reduce temperature to 180°C and bake for another 5-10 mins or until pastry look firm and cooked but without browning the coloured pastry. Allow mooncakes to cool on the tray slightly for 5 mins, then remove to racks to cool completely. Serve when they are completely cooled. Enjoy!!! Storage: As these mooncakes are made with reduced amount of sugar, they should be stored at room temperature only up to 5 days and can last up to 2 weeks if they are stored in the fridge.